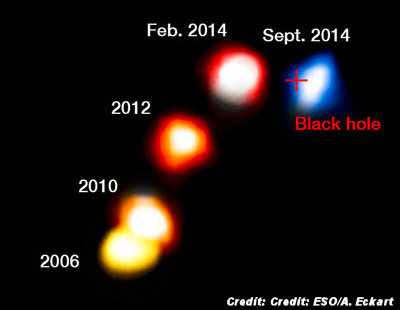 This annotated composite image shows the motion of the dusty cloud G2 as it closes in, and then passes, the supermassive black hole at the center of the Milky Way, and remains compact. The blobs have been colorized to show the motion of the cloud, red indicated that the object is receding and blue approaching. The cross marks the position of the supermassive black hole. Known to many as "G2," the unidentified object could be a cloud of gas, or it could be a star, depending on who you ask. Discovered in 2011, G2 captured the attention of scientists because it was on its way to making a tight swing around the black hole — potentially providing the dark monster with a snack. The new observations of G2 show that it has remained compact during its swing around the black hole, according to the authors of the new research. Since a gas cloud would likely be smeared out by the gravitational pull of the black hole, the scientists conclude that the object is a star. But the group that discovered G2 says the new results are not enough to make a definitive statement about the identity of this peculiar blob. . . . The term "black hole" was stated as though it were fact, four times in the first three paragraphs alone. Black holes (as well as dark matter/energy) are "mathemagical" constructs that don't exist in nature. What's being observed is likely a star that has "recently" fissioned from the plasmoid at the galactic center. Absolutely... even the likes of the late Isaac Asimov also pointed this out. This 'object' is extremely distant and if it was not 'swallowed' by a 'black hole', then the 'black hole' theory is falsified, because this behaviour is not predicted by that theory (we should perhaps say 'hypothesis').